It's the perfect compromise between notebook and smartphone, but which processor will be at its heart? Mobile internet access has come of age. No more squinting at the tiny screen on your smartphone. No more flat batteries on your laptop. With the mobile internet device (MID), you can enjoy an always-on connection, long battery life and a decent-sized screen, all in a package that will fit in your pocket. However, are the processors currently used in smartphones or the x86 chips that power laptops capable of providing all this, or will the MID require a totally new processor? Intel, VIA and ARM are already promoting their wares in a new round of processor wars. So if you're in the market for a MID, should you be looking for that 'Intel Inside' sticker – or does the competition have a trick or two up its sleeve? What do we mean by the term MID, and how does it differ from the smartphone, the laptop and other in-between devices – such as the UMPC (ultra-mobile PC)? PC Plus magazine asked the main suppliers of MID processors to define the platform. 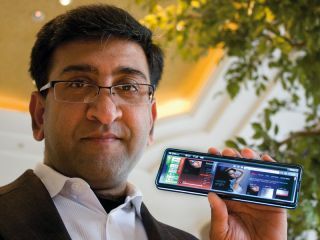 According to Pankaj Kedia, Intel's Director of Global Ecosystem Programs for MIDs, "Mobile internet devices represent a category of truly mobile consumer devices that enable the best internet experience in your pocket and allow users to communicate, entertain, access information and be productive. The MID category is comprised of mobile devices with a display size no larger than six inches and a simplified user interface. There are expected to be over 100 million units in the range over the next three to five years." Timothy Brown, International Marketing Manager for VIA Technologies, offered more in the way of technical detail. "For VIA, a MID is a five-inch form factor or less device that runs on an x86 architecture platform providing the capability of a full internet and computing experience to users. That includes the full Windows Vista, XP and Linux operating systems, the massive body of software developed for those operating systems and the ability to connect and interact with the internet anywhere at any time." However, Bob Morris, ARM's Director of Mobile Computing, had different views – almost to the point of not recognising the MID as a unique platform in its own right. "Intel coined the term MID. ARM would prefer to call it mobile internet (MI) since there is not one device but many." Morris suggested that within the next five years internet connectivity will become an essential element of a wide range of mobile devices including portable media players (PMPs), personal navigation devices (PNDs), and smartphones. To make the point, he showed us an illustration that explained how each of these types of device had migrated to the mobile internet arena. In the area of PMPs, the Apple iPod was shown migrating to the iPod Touch with the addition of Wi-Fi; with PNDs, the forthcoming Garmin NuviPhone was shown as the Nuvi Navigator (a sat nav device) with the addition of a 3.5G mobile phone and browser; and in the realm of smartphones, the Samsung Instinct has been augmented with EV-DO technology (or 3G broadband). Although other companies may be developing processors that could form the basis of a MID, to date only three companies have nailed their colours to the mast. We asked these three companies – Intel, VIA and ARM – to tell us about the processors they're promoting for the up-and-coming MID platform. As it's the processor that's had the lion's share of the media coverage, we'll start by looking at Intel's offering. Intel announced the Atom processor family (formerly codenamed Silverthorn) at the Intel Developer Forum in Shanghai in April, and subsequently rolled out five variants. The Atom processor is Intel's smallest – and, it claims, the world's fastest – chip to consume less than three Watts of power. Ranging from 800MHz to 1.86GHz, the chips are quoted as consuming between 160mW and 220mW on average and from 80mW to 100mW while idling.